One of my youtube channel subscribers, has asked me to make a video on PIVOT operator. So here we are with another sql server video. Pivot is a sql server operator that can be used to turn unique values from one column, into multiple columns in the output, there by effectively rotating a table. Now, let's write a query which returns TOTAL SALES, grouped by SALESCOUNTRY and SALESAGENT. The output should be as shown below. A simple GROUP BY query can produce this output. At, this point, let's try to present the same data in different format using PIVOT operator. 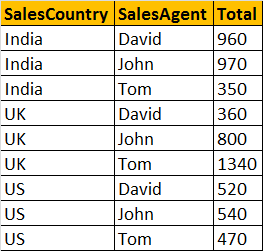 This PIVOT query is converting the unique column values (India, US, UK) in SALESCOUNTRY column, into Columns in the output, along with performing aggregations on the SALESAMOUNT column. The Outer query, simply, selects SALESAGENT column from tblProductSales table, along with pivoted columns from the PivotTable. Having understood the basics of PIVOT, let's look at another example. Let's create tblProductsSale, a slight variation of tblProductSales, that we have already created. 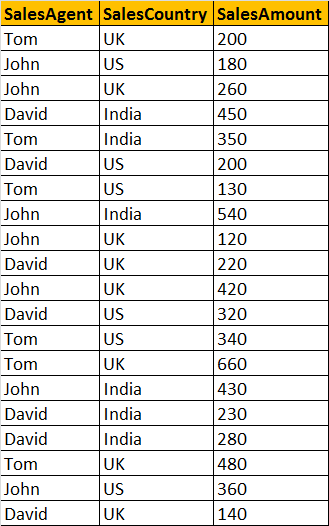 The table, that we are creating now, has got an additional Id column. This output is not what we have expected. This is because of the presence of Id column in tblProductsSale, which is also considered when performing pivoting and group by. To eliminate this from the calculations, we have used derived table, which only selects, SALESAGENT, SALESCOUNTRY, and SALESAMOUNT. The rest of the query is very similar to what we have already seen. UNPIVOT performs the opposite operation to PIVOT by rotating columns of a table-valued expression into column values. Hi Venkat sir, ur videos are awesome and these are very helpful to us and i got lot of knowledge from these videos. One request sir Please upload unpivot operator with example.